Back in 2006, Chris Anderson wrote a powerful book called the Long Tail. The theory of the Long Tail is that our culture and economy is increasingly shifting away from a focus on a relatively small number of "hits" (mainstream products and markets) at the head of the demand curve and toward a huge number of niches in the tail. As the costs of production and distribution fall, especially online, there is now less need to lump products and consumers into one-size-fits-all containers. In an era without the constraints of physical shelf space and other bottlenecks of distribution, narrowly-targeted goods and services can be as economically attractive as mainstream fare. The Long Tail book is about the big-picture consequence of this: how our economy and culture is shifting from mass markets to million of niches. Associations and nonprofits can use the long tail concept when looking at members and donors. Rather than one major event or one massive campaign, they might get better results from mini and micro events and campaigns. 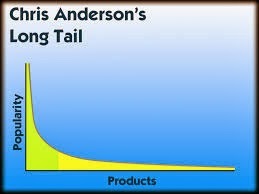 In addition to Anderson’s market views, the long tail extends to association social media. After blogging nearly full time for more than two years, I’ve observed a long tail effect from association blogs, tweets, SlideShare posts, etc. Perhaps it should not surprise me but the number of readers/viewers keep going up long after I’ve forgotten about my blog, tweet or SlideShare post. This suggests that the power of your content continues and the value of your content increases when your audiences are seeking that content. In fact, it suggests that associations should be finding ways to “freshen up” blogs, tweets, YouTube videos, Pinterest pins and other social media as a means to add value to the long tail of your social media engagement strategies. You may want to consider the advice John Haydon shares in this post headlined Four ways to get more from your most popular blog posts. What are you finding with your association’s content marketing and social media activities? Are they being read more? Do you update and refresh them periodically? Feel free to share your comments at www.scdgroup.net. Do you put your Association’s “bakery” up front?